I am excited to see a Tower be built in Fantasyland. Am I a geek? Don’t answer that. Seriously, though… Disney recently released the concept art for this amazing new character meet & greet location for Disney’s newest heroine, Rapunzel and her love interest, Flynn Ryder – bringing with it the first true architectural change to Disneyland’s Fantasyland since its 1983 makeover. The tower will be a new addition and will tie the former outdoor queue area of Pinocchio’s Daring Journey into the small cottage, currently serving as Gepetto’s Candy Shoppe. Honestly, I think I’m excited, because the design brings such an architecturally compatible entry to the existing space. It’s going to be extremely interesting to see, especially if they can truly pull off the concept drawing’s vision of the hair extending from the Tower to the Cottage. That will be an amazing challenge – to have it still look like hair and yet be durable to weather from the scortching sun to winter rains. Don’t even mention keeping the leaves from those trees on the right (in front of the Village Haus Restaurant) out of it. Also, the commitment to building this tower shows Disney’s faith that they have a winner on their hands. It’s not like having Tiana in the perfect meet & greet space – New Orleans Square - and then moving her over to the Fantasy Faire with the other princesses. They are showing a true target goal of having the character fixed in this location. Bold move. 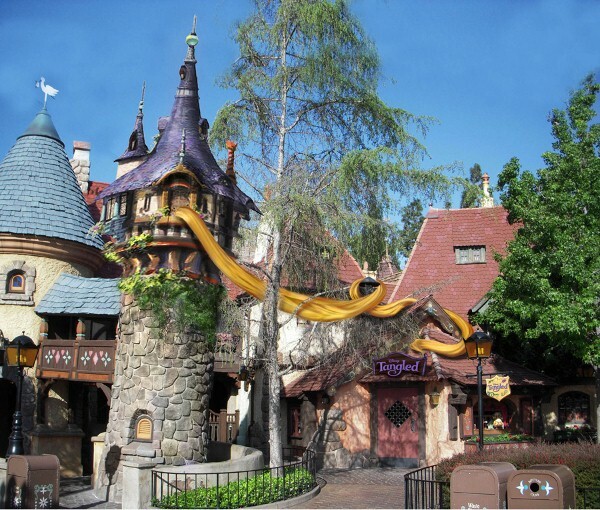 If they pull it off – I think it will be a tremendous addition to Fantasyland! Concept Art courtesy of Disneyland Media Relations. Epcot at Walt Disney World Rumor- did they lose a sponsor?